This article was originally written by Joe Crea and published on Cleveland.com on November 25, 2013. Which gave me pause, particularly when it came time to declare my ardor publicly. After all, there are plenty of casual neighborhood spots cut from similar cloth, most of them dime-a-dozen operations whose chief distinction is a kind of homogenized “comfy-ness” that droops in the harsh light of scrutiny. 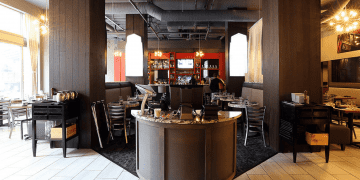 The menu they feature has a cover-all-bases kind of appeal, hitting all the common notes while employing just enough panache to keep things interesting. So do many chains, at least in theory. The chief difference is that under Kalberer’s generally watchful eye, most everything I sampled was executed with precision. That’s rarely the case in chainland, where the results sink into flaccid mediocrity. The kitchen’s attention is magnified when it comes to quality ingredients, like the seven snapping-crisp shrimp that arrived — otherwise unadorned, apart from an adequate plank of garlic bread — in a pool of buttery buffalo-style sauce under the label “Hot & Spicy Shrimp” ($10). Kalberer’s crabcakes ($11 for a pair of moderately-sized cakes) are plump and zesty without overwhelming the plump chunks of sweet crab meat. Better than Morton’s, I daresay. 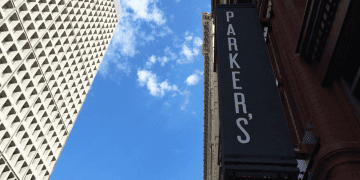 Because this is not a steakhouse per se, Parker’s leans heavily on casual offerings. Burgers, along with a selection of sandwiches (including a very good crab cake sandwich, $13) play a prominent role on the menu. The Norm Burger ($12) is maybe the best example of the extreme decadence available at Parker’s. Topped with grilled onions and mushrooms, oozing with sharp cheddar and a slice of crisp bacon — oh, what the heck, there’s a fried egg up there, too — it’s a meal big enough for a longshoreman and fit for a discerning burger lover. Hand-cut fries and a choice of a toasted Kaiser roll or a pretzel bun are part of the deal. If you choose not to share, you may want to read up on those recent studies about the benefits of statins. My wife and I equally enjoyed a Cajun spice-dusted Black-n-Blue Burger ($11). Other meaty, upscale entrees were equally satisfying and just as well handled. Because of their Morton’s credentials, the first thing I chose from the Mowbray-Kalberer menu was one of their touted hand-cut then aged Angus Reserve steaks: specifically, the 22-ounce Cowboy Ribeye (at $35, by far the top-end of Parker’s menu). It may have lacked loftier pedigrees, but this was a damned fine steak — modestly seasoned, grilled precisely as requested and still sizzling when it arrived. Good “smashed” red skin potatoes and pencil-thin grilled asparagus joined in on the plate. Recalling one daily special, seared duck breast paired with a simple cranberry relish and an excellent pilaf of farro, wheat berries and rices ($22) makes me want a few more bites though I’m still quite full from supper. By the same token, I’m hoping my son hasn’t found the leftovers from another special, a beautiful 16-ounce pork chop — double thick, grilled to a turn, and marinated then glazed in a molasses-and-coffee combo ($17). Don’t overlook the a la carte vegetables sides (each, $5). We particularly doted on the fried mix of thin-sliced brussels sprouts, onions and bacon (an occasional offering): a bit greasy, but seductive. The au gratin potatoes (a $2.50 surcharge if you sub them for the red skins) are good without overly rich creaminess. Desserts (most, $6) are modestly but satisfyingly sized. The seasonal bread pudding (one evening, pumpkin with ginger, served with cinnamon ice cream) and a moist, light lemon cake are two fine choices. There’s an actual Parker, by the way: the preschool-aged son that Mowbray and his wife, Victoria, are raising. His name hangs over a door that previously opened into eateries operated by storied Cleveland restaurateurs: Michael Symon’s Bar Symon, and the Swingos family’s Swingos Grand Tavern. 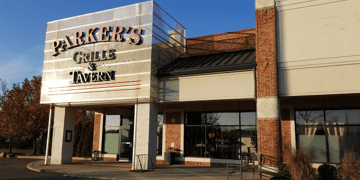 Though restaurant futures clearly aren’t the smartest gamble, if I were a betting man I’d wager that Parker’s will stick around, and that its namesake will one day help run the place.